UNITED NATIONS, Feb 6 2014 (IPS) - Cambodia’s garment industry is regularly plagued with strikes and protests. But when armed security forces opened fire on striking workers in the capital city of Phnom Penh on Jan. 3, killing five and injuring dozens, it suddenly became clear that this was not just another protest. With the situation left unresolved since, advocacy groups are urging clothing brands to review their purchasing practices and take action to ultimately end low wages, which are at the root of the bloody demonstrations in Cambodia. Statutory minimum wages determined by national governments and industries usually fall short of workers’ demands. In the case of Cambodia, the government first offered to raise monthly pay from 80 to 95 dollars, then to 100. Striking workers, however, insisted that the minimum level should be 160 dollars. Asia Floor Wage, which has been campaigning for higher minimum wages across garment-producing countries in Asia, believes that if statutory minimum wages are not high enough, multinational companies need to be involved. “Garment workers are producing for the whole global industry, so multinationals should pay the difference between statutory minimum wage and living wage,” Bhattacharjee said. “This is not an unfair demand, but brands are still not agreeing to provide the money for it,” she said. In fairness, major clothing brands did not stay silent after the crackdown in Cambodia. Companies including American Eagle Outfitters, Gap Inc. and Levi Strauss & Co. have sent an open letter to Cambodia’s government expressing their concerns over the recent violence. They also called for the government, manufacturers and trade unions to develop a regularly-scheduled wage review mechanism. In a statement sent to IPS, Levi Strauss & Co. said it is “firmly committed to sourcing in Cambodia” and encourages peaceful resolution to end political unrest. Meanwhile, a spokesperson from Gap Inc. said the company strongly opposes any form of violence, calling for negotiations among stakeholders to peacefully resolve the dispute. According to the Washington-based International Labour Rights Forum, while it is commendable that brands are willing to speak up, further steps must be taken. “Brands and retailers need to agree to voluntarily pay higher prices for apparel products made in Cambodia and require the factories to therefore pay higher wages,” Liana Foxvog, communications director of the Forum, told IPS. She said that over the past two decades, multinationals have spread their supply chains around the world, driving a “race to the bottom” among developing countries. “We have seen low wages, repression of freedom of association as well as poor working conditions,” Foxvog said. “We need a system that is different from the current business-as-usual model where brands and retailers will shop around to different factories and say who will make this shirt for two dollars. If a factory won’t, they can find a factory that will. “As a result we still have a sweatshop economy in 2014,” she said. The solution to the problem, she said, is to have all brands and retailers develop long-term relationships with suppliers so they have more control in the working conditions offshore. One month after the killings of strikers, there is still no end in sight for the crisis. Human Rights Watch released an urgent statement on February 3, demanding the Cambodian government to ensure that garment factories stop intimidating and threatening workers seeking to form unions and assert their labour rights. Last week, the U.N. International Labour Organisation (ILO) said it was “deeply disturbed” by the continuing violence in Cambodia. The agency also reiterated its earlier call for the government to launch an independent inquiry into the repression of strikers. Cambodia’s economy is dependent on the garment industry, which employs half a million workers and accounts for almost all of the nation’s exports. According to the ILO, the country just topped five billion dollars worth of garment exports last year for the first time. The garment industry is also very important because its workers, most of whom are women, not only support themselves but also send remittances to their families. Jill Tucker, manager of ILO’s Better Factories Cambodia, a Phnom Penh-based project that monitors the garment industry in the country, said working conditions have been declining since 2010, even though not every factory is a sweatshop. As developing countries try to be competitive, wages have been set “artificially low” for a long time, unable to keep up with increasing consumer prices, Tucker told IPS. And unlike other garment-producing countries where factories are not concentrated in big cities, Cambodia only has one main manufacturing hub: its capital city. Workers as a result have to pay very high living costs to stay near where they work. “If Cambodian workers were satisfied with their job and felt that the pay and the working conditions were adequate, probably we would not see quite so much unrest,” she said. 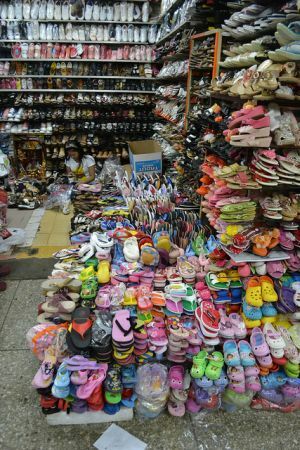 Professor Benjamin Powell, director of the Free Market Institute at Texas Tech University, told IPS that consumers should not feel guilty when they buy low-cost products made in developing countries. The term “sweatshop”, he argued, has negative connotations even though it is sometimes the best available opportunity to workers, which can lead to economic development and, at the end, better wages and working conditions. While Cambodia successfully slashed the national poverty ratio from 50 percent in 2007 to 20 percent today, it is still listed by the World Bank as a “low-income” economy. The country of 7.1 million people has a per capita income rate of 880 dollars. That compares to Hong Kong’s 36,560 dollars, according to World Bank data. Asia Floor Wage’s Bhattacharjee is hopeful that developing countries such as Bangladesh and Cambodia would soon progress to the next economic level. But for that to happen, the issue of low wages has to be dealt with. Garment-producing countries need to take wage completely out of the competition and start competing instead on logistics or raw material supplies, she said. As broader protests continue to sweep Phnom Penh streets, the strikes of garment workers have become more politically charged. But Bhattacharjee said she never doubted the real motive behind what the workers are fighting for.